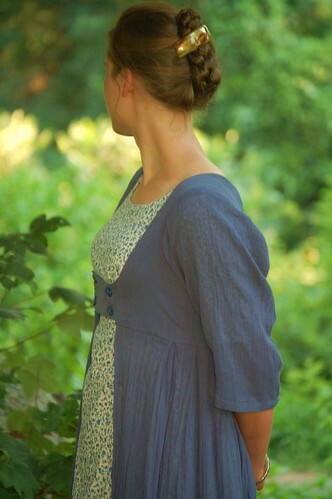 I sewed this pelisse awhile back after watching the 2005 version of Pride and Prejudice. It is made of a wonderful, light and breezy cotton gauze. The bodice is fully lined. The sleeves and skirt are unlined. The way it flows in the wind is so beautiful. 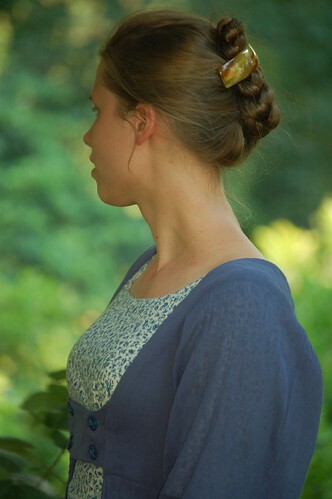 I have a green one that is identical, and they are so nice to wear over gowns. Jane's version, the blue is a bit lighter than mine, but that's okay, I like darker blue better. A better picture, you can see a full view on the far right. How pretty! What pattern did you use?